They call it foundation for a reason, right? It’s the base for your makeup look. It needs to be sturdy and up to handle everything in your day. Tarte Shape Tape Foundation is the ultimate base. Whether you chose the Matte Foundation or the Hydrating Foundation, you can trust that it will stand up to the whole day. For thick coverage, I love the matte Tarte foundation. This foundation covers every blemish. I loved the all over colour that it provides. It couldn’t be beat. On my light makeup days, I even used it as a cover up for smaller blemishes. Other days, I was drawn to the thinner Shape Tape Hydrating Foundation. This version of the foundation is much lighter. I imagine that most people will be drawn to this one more. The finish is a bit more natural. It corrects your colour, but it has a natural glow in it. Instead of a matte finish, you have a healthy fresh faced look. 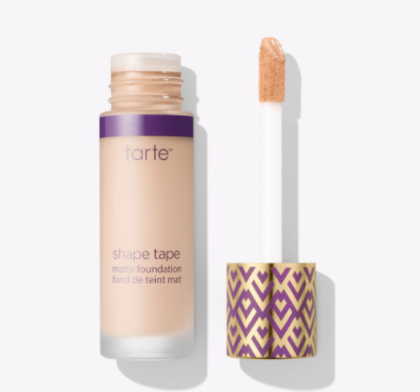 I love the matte foundation, but you really can’t go wrong with Tarte’s Shape Tape Foundation. The matte version feel like a special event makeup or set makeup, while the hydrating version is more of your everyday “natural” look.